The following costume descriptions are based on the production as shown at the Conference Center Theater in Salt Lake City, Utah. Please adapt the information to fit the needs of your production. Simplicity in costuming will enhance the spirit of the production by allowing the characters to take prominence. Costuming for Savior of the World was inspired by the paintings of Carl Bloch. See “The Life of Christ: Painted by Carl Bloch (1834-90)” article in the Ensign, January 1991, 30–50. The desired look was the flow and folds of fabrics that Bloch captured in his paintings. Costumes also helped create a marked difference between the representation of earth and heaven. The feel of earthly costumes was one of encumbrance, being weighed down and entangled by earthly matters—basic robes layered with drapes and other articles. In contrast, the angel costumes were simple and flowing, without encumbrance or entanglement. Colors for act one were soft and pastel, a spring palette. The colors used for lead roles in act two were deeper and slightly darker. The chorus wore the same costume in both acts. Nearly every robe in the show was dyed with color, then over dyed with tan or taupe to create a soft, worn look. Costume directors will create a basic approach that fits the needs and resources of their individual production. Many different approaches are possible. 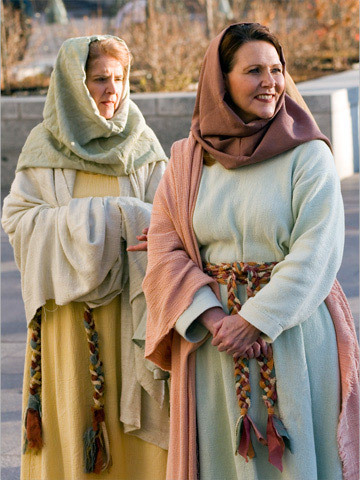 Simple biblical costumes give a sense of timelessness and can be easily created in a variety of ways. If modern white clothing is used for chorus members or angels, sensitivity to the guidance of the Spirit will assist costume directors in avoiding anything suggestive of temple attire.